A Golden distillery has raised another $3 million in equity funding as part of a two-phase expansion plan. Golden Moon Distillery announced that $6 million plan last spring. Phase one financing wrapped up last March with a $2.84 million SBA loan. When the expansion wraps up next year, Golden Moon Distillery will have upgraded from its original 2,000-square-foot space at 412 Violet St. to about 15,000 square feet in the same building, said Steve Gould, Golden Moon owner and co-founder. The distillery also will have increased its output from 4,000 to 200,000 cases per year and moved its associated tasting room, Golden Moon Speakeasy, to a bigger space. 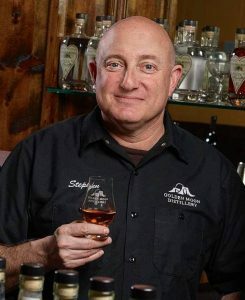 Gould founded Golden Moon Distillery in 2008 after nearly two decades of waiting for the right time, he said. Gould moved the business from Ohio to Denver in 2010 and began production two years later. The distillery now has distributors in 14 states and Italy, the United Kingdom, Denmark and Germany. 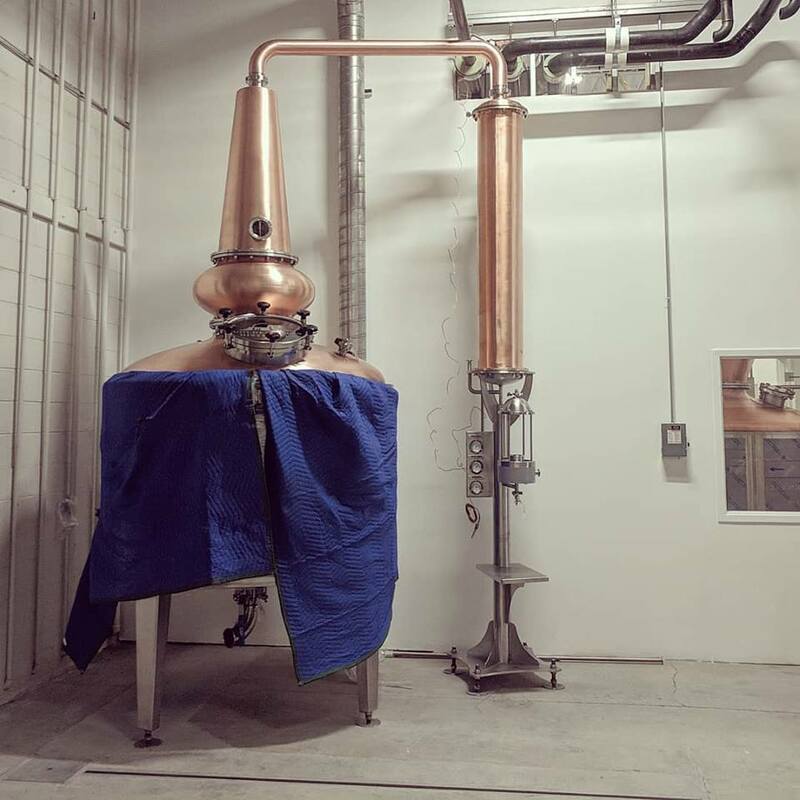 The distillery will purchase about $3 million worth of new equipment, including two 500-gallon whiskey stills, six 270-gallon multipurpose stills and nine antique stills. Gould said the business has purchased about half of this equipment so far. 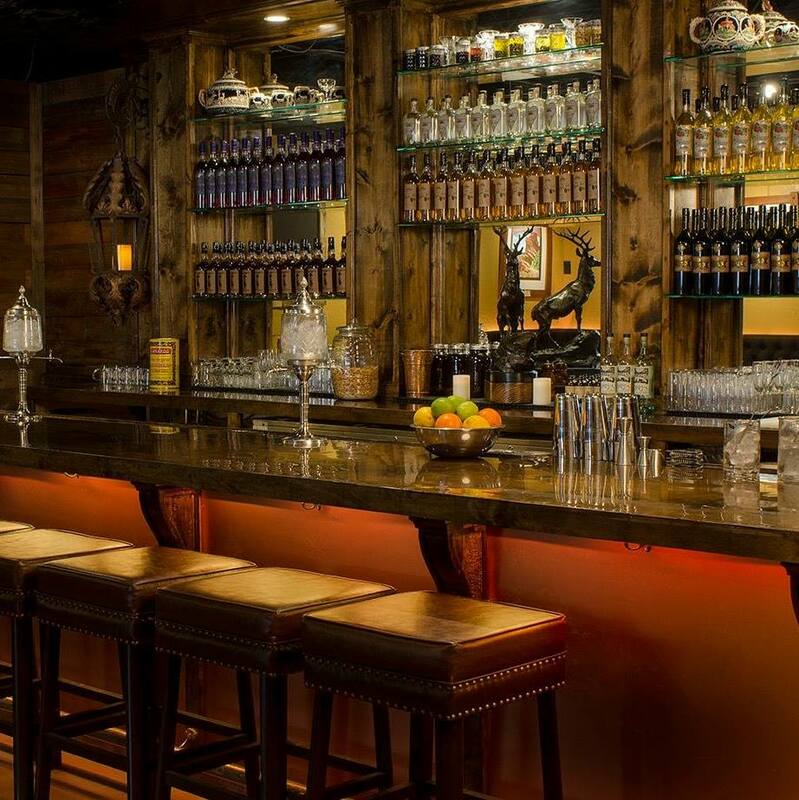 The interior of the current Golden Moon Speakeasy, located at 1111 Miner’s Alley in Golden. Phase one funding already has increased the distillery’s output to 100,000 cases per year and facilitated the takeover of about 8,000 additional square feet at the Golden site. Construction on phase one will end in the next few weeks, Gould said, and phase two will wrap up in 14 to 18 months. Golden Moon Speakeasy opened in March 2014 at 1111 Miner’s Alley in Golden. Its current 1,300-square-foot space has no storage, no full kitchen and shared bathrooms, Gould said. The new site, opening in July at 1111 Washington Ave., is a former Chinese restaurant right under the “Welcome to Golden” arch. Gould said the new location is one door down from a saloon and will bring in more foot traffic. Golden Moon Distillery partnered with contractor GE Johnson and architect Ware Malcomb for its phase-one renovations. The speakeasy worked with contractor Catamount Constructors and Boss Architecture. The site of Golden Moon Distillery at 412 Violet St. in Golden. Golden Moon is renting both spaces, Gould said. The distillery has nine years left on its lease, and he signed a 10-year lease on the speakeasy’s new location. 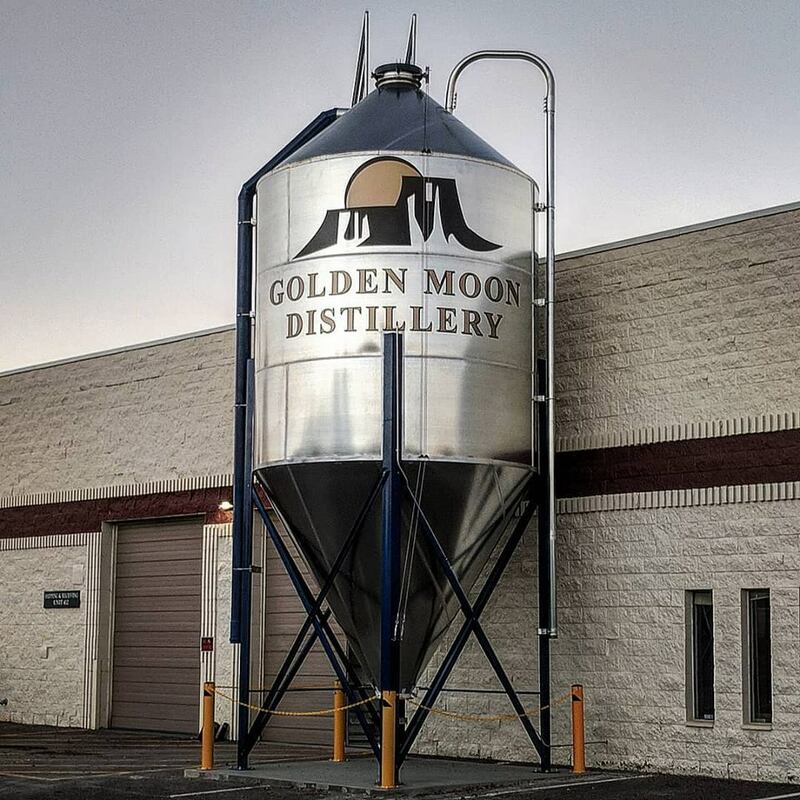 Gould said the distillery offers around 20 products; its most popular are Golden Moon Gin and Golden Moon Colorado Single Malt Whiskey. Golden Moon Distillery carries two product lines: its Golden Moon line, which is distilled in-house, and its Gun Fighter whiskey line. 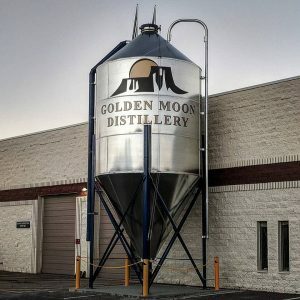 Golden Moon is gearing up to launch new products in each line: Golden Moon Principium Colorado Single Malt Whiskey and Gun Fighter 13 Tennessee Orphan Cask Bourbon, which was purchased from a Tennessee distillery and will be released in March. The distillery already has relationships that provide access to 60 to 65 percent of the U.S. market, and Gould seeks more distributors. In the next year, he’s hoping to add Texas, as well as four states along the Eastern Seaboard, to the distillery’s lineup. One of two new 500-gallon whiskey stills purchased by Golden Moon Distillery as part of its $6 million expansion plans. He had hoped to finalize relationships with distributors in China and Mexico as well, but said the talks fell through due to the ongoing trade war. Between the distillery and the speakeasy, Golden Moon has 12 employees, Gould said. Once the distillery finishes construction in the next few weeks, he’ll add another six, and when the speakeasy moves into its new location later this year, he’ll add another three or four. Gould also hopes to add another six to eight employees in U.S. markets in the next 18 months. 1 Comment on "Golden distillery in expansion mode raises another $3 million"
That is awesome Stephen!! Way to produce a great product!